If you are planning to bring your pet to travel, at the park, or on your hiking, it is highly important to bring the best dog travel bowls with you. Some might think that it might be hassle for them; good thing the Best Dog Travel Bowl will provide portable, eco-friendly, and safe to use travel bowls perfect for your getaways! 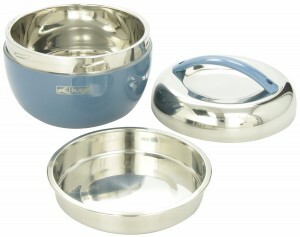 Wander Pail Dog Travel Bowl includes one food container and a stainless steel bowl. It can hold up to 1300 ml of fluid. Its lid and handle is ergonomically designed for easy toting. This travel bowl is made of high quality materials free of BPA. Just be reminded that it is not microwaveable. 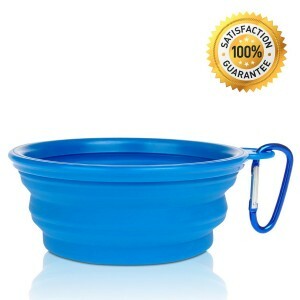 The Wander Pail Dog Travel Bowl measures 6 x 6 x 5 inches and weighs 1.2 pounds. 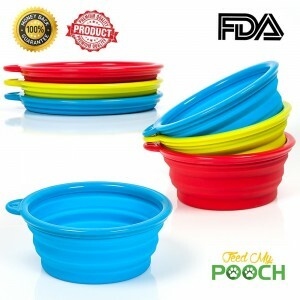 Silicone Dog Collapsible Travel Bowl is composed of 3 travel bowls which is expandable and can hold 1.5 to 2 cups of liquid. What makes it convenient to use is that you can put it in a small pocket to save space during the travel. So when your dog is already hungry while on the road, you can just expand the feeder and pour some food. Silicone Dog Collapsible Travel Bowl is perfect for small to medium sized dogs. It has a nonporous, high quality silicone. Moreover, it is dishwasher safe and easy to clean. Nom Nom Travel Dog Bowl is widely known for its eco-friendly, ergonomic, and stylish features. It has a built in belt grip so you can attach it to your waist or backpack. It is dishwasher safe and can be easily cleaned by soap and water. This is ideal for feeding your dogs while on the road. Moreover, Nom Nom Travel Dog Bowl weighs 2.4 ounces. Collapsible Silicone Dog Travel Bowl is ideal for having outdoor activities with your dogs. It is portable and easy to use as you can fold and collapse the feeder wherever you want. It has quick release carabiner that you may clip on your waist, dog’s latch, or backpack. It is made of BPA free, high quality plastic material. Collapsible Silicone Dog Travel Bowl has a dimension of 7″ wide and 3″ tall each cup. 2 Pack Dog Travel Bowl includes two pieces of travel bowls wherein you can separately put liquid and dry food. It is made of nylon to keep the bowl waterproof. It also has a clip which you can attach in a safe place like your backpack. 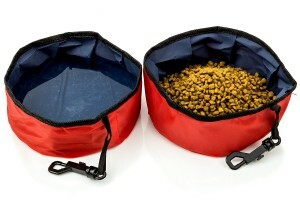 The 2 Pack Dog Travel Bowl measures 7 x 4 x 2 inches and weighs 1.3 ounces. There are instructions on the back card if you are not familiar with its features. Travel Dog Bowl Dish for Food and Water is ideal for traveling and going outdoors as you can feed your pets conveniently. It can be carried easily. Also, it has sealable vacuum top to keep the food and water fresh. The bowl can hold up to 20 oz pet food. Its ergonomic rounded-shape protects the food from getting harmful bacteria caused by air and long exposure. The purpose of the top bowl is to keep liquid, and the other one is meant for dry food. Don’t worry about the spillage because it has an airtight seal that keeps food in place. This product is non-toxic and user-friendly. 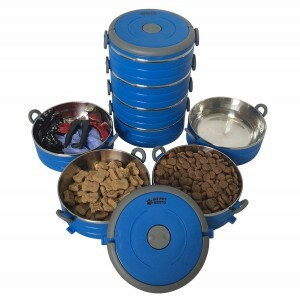 Travel Dog Bowl Dish for Food and Water is available in blue, pink, and green colors. It measures 6 x 6 x 9 inches and weighs1.6 pounds. You can choose from small which has two bowls, medium which contains 3 bowls, and large which includes 4 bowls. Portable Airtight Dog Travel Bowl is ideal for pet owners who travels or goes out a lot. This airline-approved travel bowl is portable that can store food for 2-5 days. It also has collapsible fabric bowls hat you can use anywhere. Portable Airtight Dog Travel Bowl is BPA free and easy to wash. It also comes with two pieces fabric bowls. Travel Dog Bowl by RopriPets, one of the 10 Best Dog Travel Bowls, is made of FDA approved silicone ideal for feeding your pets outdoors and while travelling. You can clip it either on your backpack or dog’s latch. It has three pieces of collapsible bowls as well. 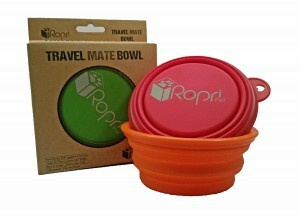 Travel Dog Bowl by RopriPets is dishwasher safe and available in random colors. It can store up to 1.5 cups of food; ideal for large sized dogs. Ultra Bento Travel Dog Bowl Dish comes with stacked bowls available in small, medium, and large sizes depending on your dog’s needs. It can hold for up to 16 ounces of liquid. It is non-sticky, free of BPA, and dishwasher safe. 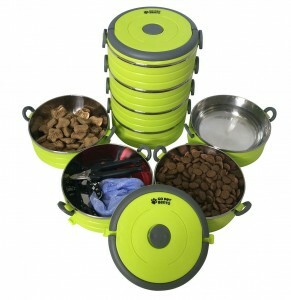 Ultra Travel Dog Bowl Dish is available in green, pink, and blue colors. Furthermore, it includes user’s manual and guide for travel tips. It measures 6 x 6 x 9 inches; 1.3 pounds. High Quality Easy Clean Dog Travel Bowl is made of FDA free food grade silicone materials which is easy to clean using soap and water. If your dog got hungry on the road, you can just collapse the bowls and pour water and food on it. Whether you want to store dry food or liquid, this travel bowl will suit all your needs. Moreover, it is ideal for dogs ranging from small to medium sizes. High Quality Easy Clean Dog Travel Bowl weighs 58 grams and has a dimension of 5 x 2 inches and 5 x 0.5 inches. Available in red, blue, and yellow colors.